In a forgotten corner between the cities of Reno and Sparks lies a piece of land incased in a wrought iron fence along 21st street. Within the fence there stands an eight foot obelisk comprising of four plaques on each side, listing the names of 767 patients who were buried at one time in unmarked graves at the Nevada State Asylum Cemetery. Why? Between 1882-1949 the state asylum buried its deceased patients in shallow, unmarked graves within its own cemetery. Over the years, urban development has taken place and caused horrifying desecrations on the cemetery’s grounds. It wasn’t until very recently the attitudes of society within the State of Nevada and the City of Sparks, started to show any kind of interest for the proper respect and recognition of its deceased patients buried within the cemetery. 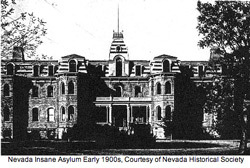 For many years disrespectful burial conditions took place at the Nevada State Asylum Cemetery due to negative and insensitive attitudes toward the mentally ill. As a child living on Hymer Street in the 1940s, across from the cemetery, Dennis Cassinelli saw how deceased patients were dropped into shallow graves in makeshift coffins made out of cardboard boxes. “They then covered the grave over with dirt, leaving only a mound to mark the spot” (Cassinelli). Grave sites often became neglected with no records of where each individual patient was buried (“Friends of Northern Nevada”). Patients at the asylum were seen as unfavorable in death as well as life. Mentally ill people were not valued as worthy of a proper funeral alongside sane people within a regular cemetery. As the City of Sparks expanded, urban development on the cemetery’s land became a more vital matter with no essential to relocate the graves in regards to the buried patients. In 1945 a pipeline was dug through the cemetery, disrupting the graves and exposing many of the corpses that would be used as back fill (“Relocating a Nevada Cemetery”). According to Cassinelli, “Several of the bodies were pulled apart with arms and legs dangling from the sliced coffins into the muddy water at the bottom of the ditch.” During the 1960s, the state asylum was emptied and torn down after a new mental hospital was built farther down the way. The land over the cemetery was leased to the City of Sparks for the construction of Pinion Park, where families picnicked and played on the top of the buried patients’ unmarked graves well into the 21st century. While paving 21st Street in 1977, construction workers disturbed and uncovered the remains of nineteen deceased patients from the cemetery (“Friends of Northern Nevada”). After the asylum relocated, the cemetery’s unmarked graves and boundaries were abandoned and lost through time only to be desiccated during the modern growth and development of Sparks in the second half of the 20th century. Today, with a change in society’s attitudes toward the mentally ill and a growing interest in genealogy, people have become curious about their relatives buried in the unmarked and often disturbed graves within the States’ forgotten cemetery. Carolyn Mirich, who has a passion for her family genealogy, found she had a relative buried in the state asylum’s cemetery, pushing her to create the Friends of Northern Nevada Adult Mental Health Services Cemetery, a non-profit organization to help protect and preserve the cemetery (“Friends of Northern Nevada”). 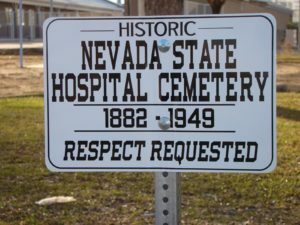 In 2009, Nevada passed SB256, “An act relating to innkeepers; revising provisions relating to the civil liability of innkeepers; and providing other matters properly relating thereto.” With the asylum considered an inn; the bill designated the land of the asylum’s cemetery as a historical cemetery. The cemetery now has a fence and obelisk marker to commemorate the 767 patients who are known to have been buried there. On January 21, 2011 the Friends of Northern Nevada Adult Mental Health Services Cemetery held a dedication ceremony to remember the deceased patients with prayers and speeches. 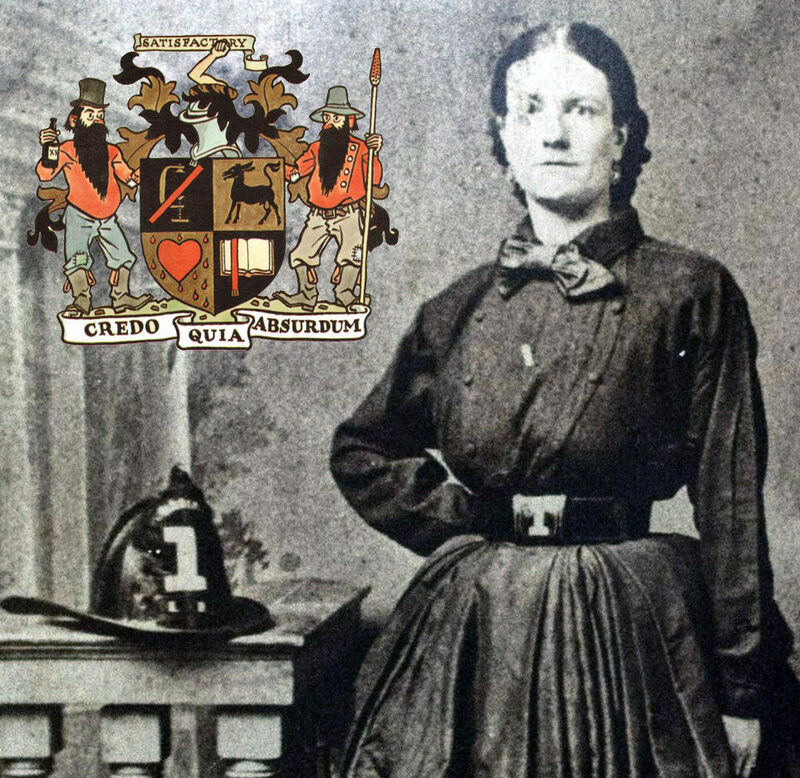 In her speech, Carolyn Mirich stated, “Now families and members of the community have a place to come show their respect and see the names of their ancestors proudly displayed on the new monument, not shamefully hidden (“Friends of Northern Nevada”). With the change in attitude toward the mentally ill and an interest in who was buried in the cemetery, it took over 60 years for the deceased patients buried in the State asylum’s cemetery to receive the kind of proper respect and gratitude they so long deserved. With a new understanding of mental illness, the State of Nevada and the City of Sparks have finally given their withheld respect to its neglected patients buried in the old Nevada state asylum cemetery. The creation of the new historical cemetery now recognizes the patients who are resting there and have been desecrated, lost or forgotten. Curious descendants of those buried in the cemetery can see that the burials of their relatives are finally acknowledged, protected and safe from any further misfortunes. Cassinelli, Dennis. Excerpt from “Chapter 1.” Uncovering Archaeology. Dayton: Dennis Cassinelli, 2009. “NV SB256 | 2015 | 78th Legislature.” LegiScan. LegiScan LLC, 21 May. 2015. Web. 25 May. 2015. <https://legiscan.com/NV/bill/SB256/2015>.